When experiencing the benefits of exercising in a PDC Swim Spa, the natural buoyancy of water supports the body's weight, reducing stress on the joints, minimizing pain, and offering one of the most effective workout routines. Water provides 12 times the resistance of air, so as you move, you're really strengthening and building muscle. Swimming is the second most popular sports activity and a great way to get regular aerobic physical exercise. Swimmers have about half the risk of death compared to inactive people. Enjoy exercising longer in water with less effort and reduced joint or muscle pain associated with land based exercising. If you are new to exercise or can't swim, don't worry. Walking in a swim spa can benefit anyone, including non-swimmers. And if you fall in love with aquatic fitness, you can keep going in cooler months - just turn up the heat and stay fit year round! Water is an excellent base for exercise, providing an anti-stress environment for move-ment, using the water's resistance to build muscle strength and flexibility. The warmer water of the swim spa induces vasodilation, which draws blood into the target tissues. The increased blood flow delivers oxygen and nutrients to the tissues while removing cell wastes. This helps promote faster healing of injured tissues. The warmth also decreases muscle spasm, relaxes tense muscles, relieves pain, and reduces swelling. This promotes a more relaxed mood where you will fall asleep faster and stay asleep longer. Children and adults alike will play for hours, improving swim skills, mastering water games and burning energy. 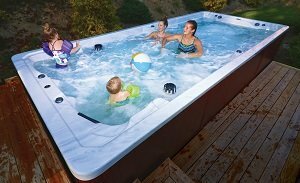 Kids will learn how to "ride the wave" in the adjustable water current, while parents and grandparents find peace of mind knowing they have a private, safe place to teach the little ones how to swim and be water safe. The main advantage of exercising in water is that it offers resistance in all directions, compared to land exercises where you work only against gravity. Exercising in a swim spa increases aerobic endurance, builds greater flexibility and increases muscle tone. With a PDC Swim Spa, your workout routine is easily programmed for a custom fitness session according to the length and resistance that best suits your goals. A massaging effect is created when your muscles are surrounded by water. Add the water's warmth and our powerful jet action for a soothing relaxing experience from neck to toes in any one of the PDC Swim Spa models. Aquatic exercise is a high calorie burning workout aiding in weight control, while renewing energy levels and releasing stress and tension. Sit back and melt into the warm swirling water, surround yourself in the soothing glow of soft LED lighting and enjoy the starry night like never before. And the best part, your PDC swim spa has been designed to perform in any season! Your home oasis is yours 365 days a year.